What did we do before our phones had good-quality cameras attached? I know what I did — carried a point-and-shoot in my purse. And before that, I just missed out on being able to share random things I see. But since blogs didn’t exist then, none of us knew what we were missing. Onward, to things I’ve photographed! 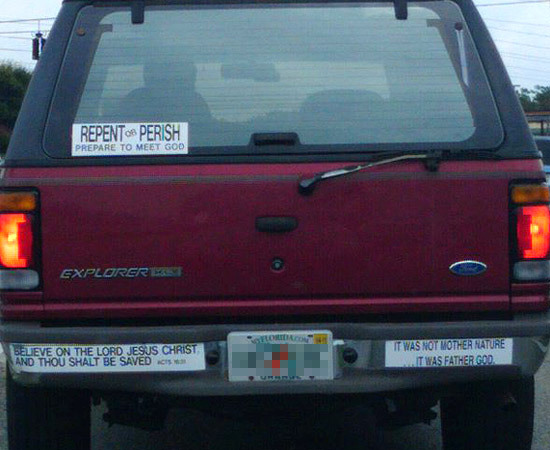 I don’t ever want to get into a car accident with a vehicle that reads “prepare to meet god” anywhere on it. It seems more like a threat than a recommendation, you know? At any rate, this guy’s bumper stickers had a charming homemade look about them. 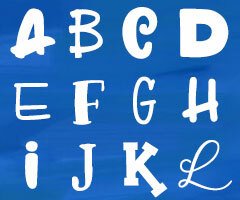 I wonder how I can print up slogans on strips of vinyl? We found this display at the local Publix supermarket — a huge bin full of little 8-ounce bottles of colorful pop. It was the name “Chubby” that caught my eye, since the ingredients list pretty much started with high-fructose corn syrup and made its way through two other sugars. At least this is semi-truth in advertising! 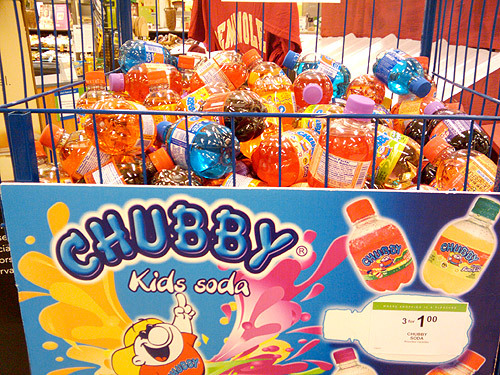 If you want chubby kids, give them this soda (pop)! 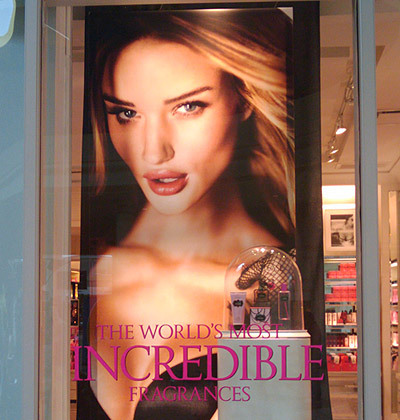 At the mall, this huge window display in the Victoria’s Secret smellystore caught my eye. Yes, our mall has three VS properties — the regular Victoria’s Secret, full of underthings; the VS Pink, full of collegiate underthings; and this third place, which is all perfumes and lotions and I will never go in there because it smells too much. Anyway, this woman’s face seems somehow wrong. Maybe it’s the shadows, or maybe this is a Photoshop disaster. 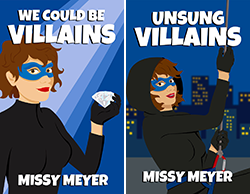 Her puffly lips, her mangled nose, her GINORMOUS collarbones. It’s all wrong, wrong, wrong. And lastly, from the home front: bouncy balls. Our littlest cat is really taken by these foam balls, and will carry them around in her mouth. Then she meows at you so you’ll throw it for her, but because she has a foam ball in her mouth, it sounds hilarious. They certainly don’t stand up to much abuse, though — our carpet is covered with little shreds of red and purple, and those balls look like incomplete Death Stars. I just gave her the green one yesterday. Naturally, Target stopped carrying these toys two weeks after I bought them. Because that’s what the stores here do. « Sourdough: Time to Bake! 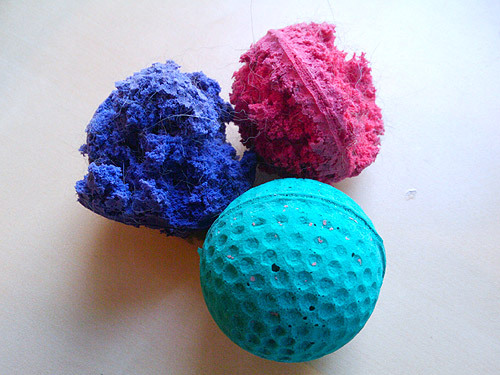 I have literally dozens of foam ball corpses scattered around my house. Behind the fridge, under the sofa, behind bookshelves, you name it. She also puts them in my shoes at night (truth).